Here’s a beer with a very special place in my heart. Something which for seven years was about the only beer I drank. It’s typical of a type of Mild brewed in Yorkshire, lying somewhere between pale and dark. Weirdly, all those years I drank it, I never realised that it wasn’t really that dark. More of a dark red than brown. The effect of the war is plain to see in the grist. Flaked barley was forced on brewers as a replacement for flaked maize during hostilities. It’s interesting to see how Tetley’s adjunct usage changed over time. In 1939 it was grits, in 1941 flaked rice, in 1943 flaked oats, in 1944 flaked barley and flaked oats and in 1945 flaked barley. All mostly out of the brewer’s hands. What I’ve interpreted as brown sugar was listed as Barbados in the brewing record. While what I’ve put down as No. 3 invert was mostly ERC with a touch of G & S. No idea what either of those were but No. 3 is probably the best substitute. The hops were a combination of Kent and Worcester, with no mention of variety. Chances were that they were Fuggles. Though there’s not much difference in the OG compared the version I drank, the high degree of attenuation leaves this beer about 0.6% ABV stronger. The gravity is quite high for a Mild of this period. 1027-1030º was more typical. I've got that showcard in my collection. The G & S was probably an admixture of glucose and sucrose added to the sacch blend, quite probably for priming at the racking stage. The colour and abv seems pretty similar to Magee Marshall 's BB(best beer / mild). 9 SRM? Was it really that light, or does it need some brewer's caramel like in the 1945 recipe on this site? 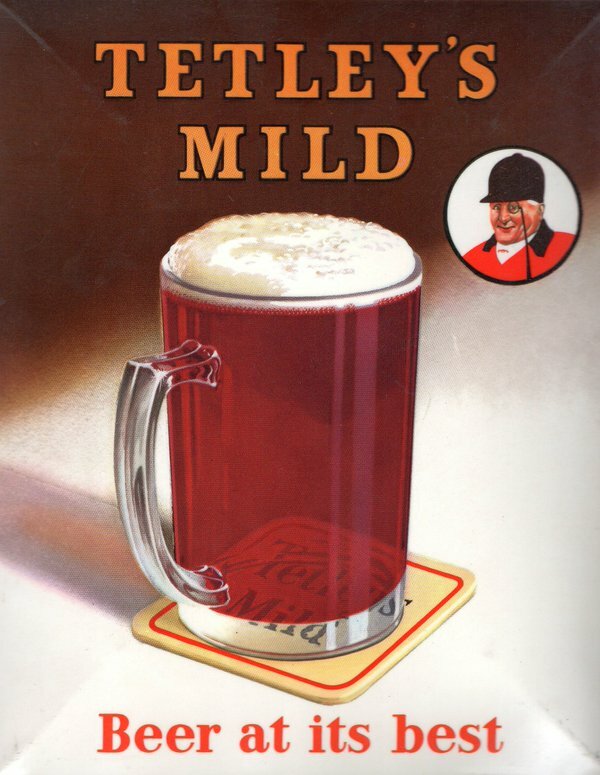 I'm brewing this today as I was looking for a good Yorkshire Bitter to use up my bottle of Wyeast 1469 West Yorkshire Ale yeast cake in the fridge, and I came across this Tetley's Mild. Been on the wrong side of t'Pennines lately with Bod and Duttons so time to come home for a while. Last pints of Tetley's I had were the bitter in 1976, in a pub in York full of ancient geezers in cloth caps and mufflers and served SA Brain's style furiously through a tight sparkler with the runoff going back down to the cask. Nectar. Is there a recipe for bitter as well, on your blog anywhere? I brewed this a few weeks ago with Chevalier, and what I had left for flaked barley with 6 oz of wheat malt. Pre carb samples were tasty with a sqiunt of brown sugar in the flavor. have to tasted the finished beer yet? I just kegged it up on Sunday and tossed a gallon in a polypin. I'll report back with my tasting notes. It's definitely different than I expected.